It’s not often that a date comes calling 20 years later. But I guess I made an impression. In 1991 or so, we went on a Rock Climbing Date. Imagine the trust involved on a first date, to let a guy strap me into a harness and dangle me by a thread from a very, very tall cliff. Before I got banged around by life, it was much easier to let go with blind trust and reckless abandon. What I remember most about that Date is how sore my fingers were afterwards…I never knew I had that many muscles in my fingers! That stayed with me. Thanks to the infinite power of reconnecting technologies, Rock Climbing Date tracked me down. He casually mentioned he had something for me, something he’d been carrying around for 20 years or so, waiting for the chance to give it to me. I was intrigued. We live 3000 miles apart, but I just happened to be passing through his neighborhood. I texted him and within 20 minutes, he appeared, bearing the mysterious, old gift. He walked into the bagel shop practically hidden by the gift he was holding. It was a big, framed photo of me scaling that cliff, oh-so-long-ago, in practically a different lifetime, when everything was new and nothing was scary, and I was invincible. It was me, with a slightly younger face, in the same body, smiling triumphantly while clinging onto that rock-faced cliff for dear life. 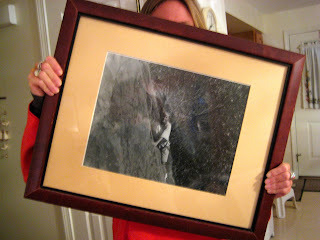 I’m not the huggy-huggy type at all, but I sprung out of my chair to envelop Rock Climbing Date in a spontaneous squeezy hug, framed photo and all, for his incredible long-term thoughtfulness. I’m still smiling triumphantly, while clinging on for dear life. And now I have the picture to prove it.